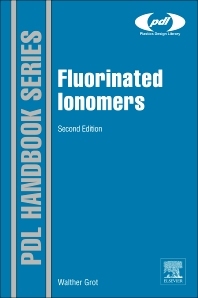 Fluorinated ionomer polymers form impermeable membranes that conduct electricity, properties that have been put to use in large-scale electrochemical applications, revolutionizing the chlor-alkali industry and transforming production methods of some of the world’s highest-production commodity chemicals: chlorine, sodium hydroxide and potassium hydroxide. The use of fluorinated ionomers such as Nafion® have removed the need for mercury and asbestos in these processes and led to a massive reduction in electricity usage in these highly energy-intensive processes. Polymers in this group have also found uses in fuel-cells, metal-ion recovery, water electrolysis, plating, surface treatment of metals, batteries, sensors, drug release technologies, gas drying and humidification, and super-acid catalysis used in the production of specialty chemicals. Walther Grot, who invented Nafion® while working for DuPont, has written this book as a practical guide to engineers and scientists working in electrochemistry, the fuel cell industry and other areas of application. His book is a unique guide to this important polymer group and its applications, in membranes and other forms. The 2e expands this handbook by over a third, with new sections covering developments in electrolysis and membranes, additional information about the synthesis and science of the polymer group, and an enhanced provision of reference data. Ion Power, Inc. (former DuPont), Delaware, U.S.A.